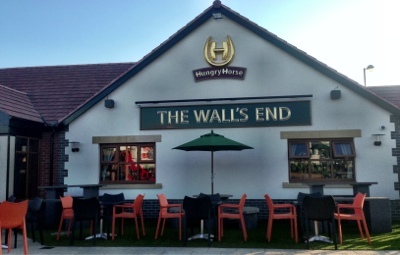 We were invited to attend a preview evening for the much anticipated new Hungry horse pub aptly named 'The Walls End' tonight, ahead of it's full opening on Wednesday 28th August. We jumped at the chance as it is near where some of our family live and close to our workplace. 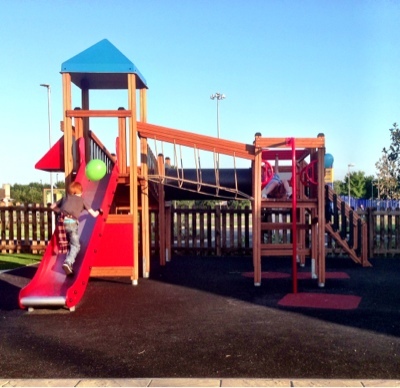 Plus the play area looked fab. From the outset it is clear that this is a very family friendly pub - my children were given balloons and activity packs straight away and we were told about the brand new play area outside. That kept them happy! The interior is original and very much linked to the local area and our history - we spied local heroes from Sting to Shearer all being included in the decor. 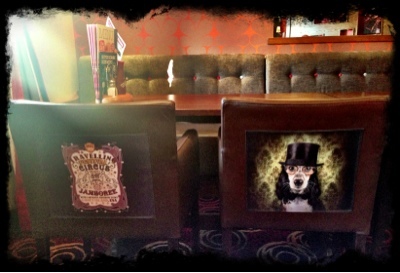 You don't feel like you are in a chain pub at all - the decor is very unique. Part of the pub that will particularly appeal to sports fans is the booth's towards the rear of the pub which all have their own private tv screen showing the footy. 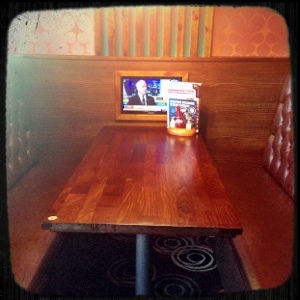 These booth's are likely to be very popular with the locals and are an inspired addition! Back to the menu! My husband ordered the steak and ribs combo, I ordered smothered chicken and the kids all ordered chicken nuggets, chips and corn on the cob. (I love it when you can choose a veg as a side at no extra cost). Service was very friendly and efficient and our food arrived in no time. 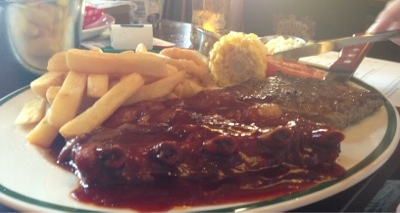 My hubby's steak and ribs combo was HUGE and his steak was not overcooked which happens all too often. My smothered chicken was also huge. I liked how you got peas, onion rings and tomato all included. No trying to charge you for extras here! The children's meals were sent out in a basket. The chicken nuggets were good quality and my children all enjoyed their meal. 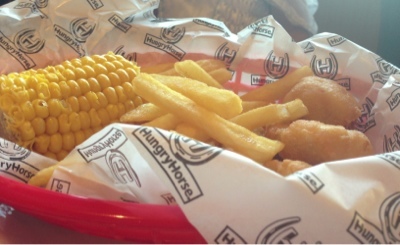 (Small children's meal pictured) In fact none if us had any complaints at all. 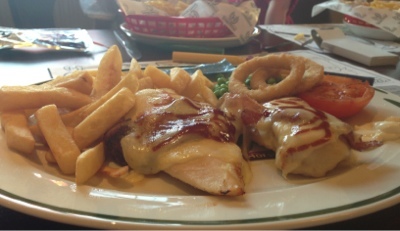 Hungry horse pub's offer a variety of different meal deals. I particularly think the kids eat for £1 on a Mon or Tues or £3.50 to include a dessert and drink (with any adult main course purchased) is fantastic value. Will definitely keep this offer in mind for a mid week after school treat. 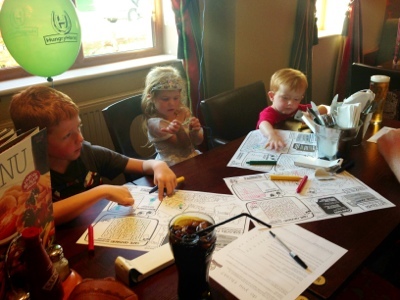 Pubs with decent play areas that also serve good value meals are few and far between. For us, The Walls End ticks all of the boxes and we will be back! Isaac I have deleted your comment due to bad language which I will not tolerate on my family orientated blog. The four letter word I used beginning with S? Which in context, I said was repeatedly shouted by 2 young 'ladies' having a heated discussion, in front of my kids? Really? As a parent I feel my review was more accurate than yours, the place is a dive and the customers are rough, they care not that children are present and chat openly about theft and drugs. If you feel me pointing this out to other unsuspecting family's, bearing in mind we attended on your recommendation is wrong then I think you are more worried that negative feedback will result in you not getting anymore free previews. If you can't tolerate an honest review from paying customers I can't tolerate your bias reviews any further. I Do not gain anything in giving somewhere a good review - everything is accurately described as we found it on the day of our visit - I did clearly state this was a preview evening. I do not condone any sort of swearing in my life so did not wish to see it on my blog. I do however welcome people's non-abusive comments and love hearing other peoples experiences. I am very sorry you did not enjoy your visit, the best thing to do would be to contact the walls end management team who I am sure will listen to your concerns. 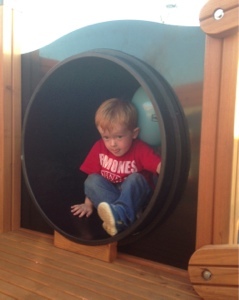 A trip to Alnwick garden in the summer holidays!